Despite the blustery west coast weather that Vancouver typically receives in the late autumn and early winter season, this does not deter locals or visitors from visiting the iconic English Bay, a captivating ocean side with one of the most panoramic vistas of the city. It’s virtually jam-packed with people for the popular New Years Day Polar Bear Swim as well as for the internationally acclaimed Celebration of Light fireworks festival in the summer, but during the late fall/early winter when English Bay in the West End neighbourhood is less crowded does it become an interesting area that is truly worthwhile to investigate. Stanley Park In Our Backyard! At Lord Stanley Suites on the Park, wake up to a freshly brewed cup of java while you admire a magnificent sweeping vista of nature’s playground outside your window, where Stanley Park is situated right next door; replete with a glorious view of the snow capped North Shore mountains as well as picture postcard perfect Coal Harbour. 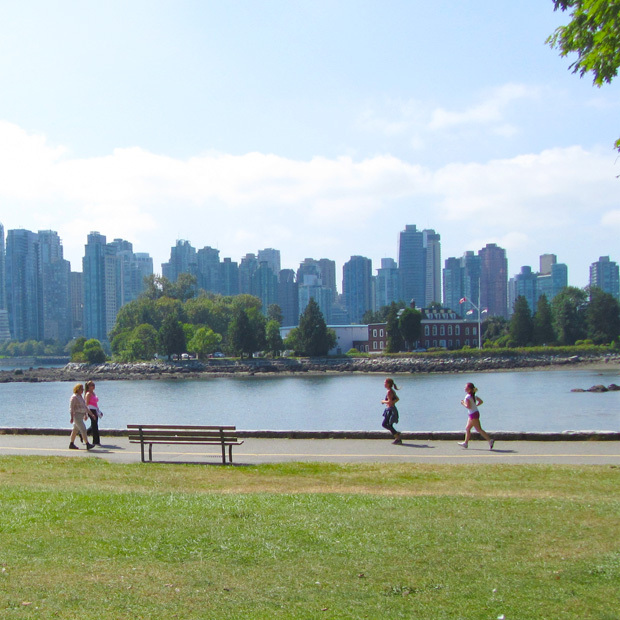 Regardless of the season, there’s always plenty to see and do in Stanley Park year round. The best thing about it? Most of it is free of charge. Hop on a Scenic Harbour Cruise! If you’re ready to embark in a scenic little adventure to view Vancouver from a different perspective, stroll over to Harbour Cruises located at the foot of Denman St., just steps away from Lord Stanley Suites! Take the one hour harbour tour (inside Burrard Inlet) on the MPV Constitution: you’ll get the opportunity to see many highly rated attractions which you can view comfortably either up top on the observation deck or below deck inside the cabin. Fall is definitely the most spectacular of all seasons in Vancouver’s Stanley Park: pleasantly sunny afternoons with a decidedly crisp nip in the air, crimson and orange leaves festooning the trees and scattered on the ground make for a breathtakingly beautiful backdrop for visitors to the park. What is the world’s best park, according to TripAdvisor? It’s right here in Vancouver and located at the doorstep of Lord Stanley at the Park! You might have guessed Central Park in New York City or perhaps Luxembourg Gardens in Paris, but Stanley Park, just a stone’s throw away from us is clearly the hands down winner. With hundreds of thousands visits annually, this 1000 acre park is majestically situated just west of the downtown core. Features include postcard perfect beaches, a world class aquarium, several fine dining establishments, breathtaking views and sweeping vistas, not to mention a scenic 5km seawall for cycling and strolling, it’s no wonder Stanley Park is the best park in the world. Welcome to the Lord Stanley On the Park Blog! Need information about what to do and where to go during your stay? Take a look at Lord Stanley on the Park blog, regularly updated for helpful hints on how to get around the city and for insider information on Vancouver’s must see, must do!